American A.R.M.Ys, be prepared because the lovable boys of BTS (Bangtan Boys) will be bringing their latest concert series your way this summer! Managed under Korean agency Big Hit Entertainment, it has been announced on March 16th PST that Korean group BTS will be stopping at four major cities with Episode II: The Red Bullet in the United States under American production company SubKulture Entertainment. While this is not their first trip to America, having participated in KCON and MAMA last year, it certainly is the first time they will be bringing a concert tour through the country. 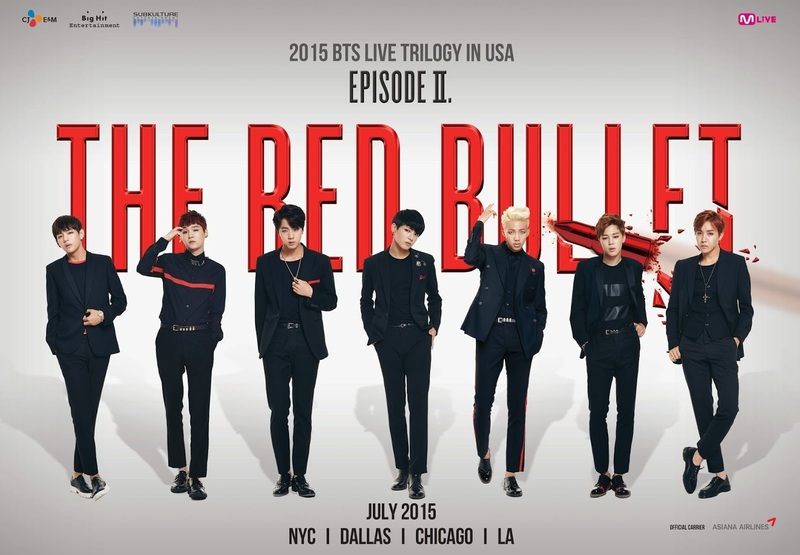 BTS will be visiting New York City (New York), Dallas (Texas), Chicago (Illinois), and Los Angeles (California) this July. Consisting of seven members — leader Rap Monster, Jin, Suga, J­Hope, Jimin, V, and Jungkook — BTS made their debut in June 2013 with “No More Dream,” and has since then released additional albums that has gained attention from fans all over the world. They have proven to be quite the fierce group and already has several major awards under their belt, including those at the MelOn Music Awards (2013), Golden Disk Awards (2014, 2015), Seoul Music Awards (2014, 2015), as well as the Gaon Chart K­-Pop Awards (2014, 2015). The seven-member group reached an all-new high when they starred in their own reality show via Mnet called BTS American Hustle Life, where they met and worked with hip-hop legends Coolio and Warren G during their stay in Los Angeles. Most recently, Warren G and Rap Monster worked together for the track “P.D.D (Please Don’t Die)” with the former taking charge in its production. Rap Monster is also set to release his first public mixtape, unveiling the music video to “Awakening” ahead of time, and had worked with hip-hop project group MFBTY (Yoon Mi Rae, Tiger JK, Bizzy) on a track in their upcoming album, Wondaland.